Sarah: Why is it self-righteousness goes hand in hand with resistance movements? 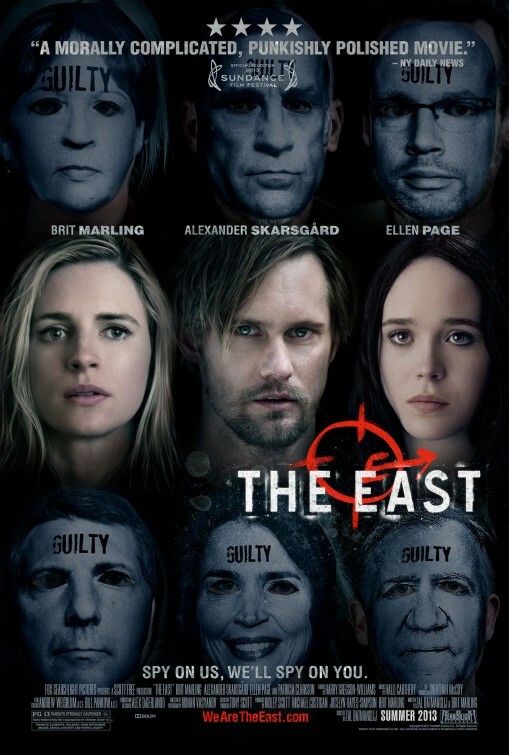 The new eco-thriller from the minds of up and coming screenwriting duo, Zal Batmanglij and Brit Marling, entitled THE EAST, plays about as far east from the middle of the road as one can expect from a studio picture. And with it, Batmanglij and Marling make the leap from independent filmmakers – their first effort being the festival hit, SOUND OF MY VOICE – to full fledged Hollywood filmmakers, without sacrificing one bit of their independent spirit. It’s a far cry from when they themselves lived the lives of nomads, hopping trains and eating discarded food out of dumpsters to survive. Had they never been there though, they might never have written THE EAST. 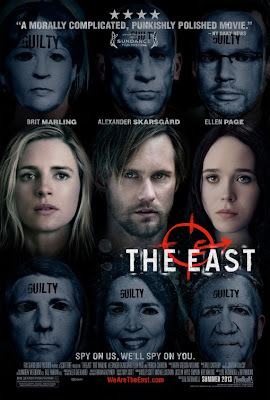 Marling also stars, just as she did in SOUND OF MY VOICE, in THE EAST, as Sarah, an undercover operative who infiltrates an anarchist group of eco-terrorists who live in some undisclosed woods. Her journey there was no simple one, mind you. To infiltrate this group, known as The East, Sarah had to convince them that she was just like them, that she rejected certain societal norms like having a home and a job to support said home. It also meant that she had to convince them that she was capable of going along with their plots to bring down giant corporations whose policies, practices and products were doing direct damage to the planet and its inhabitants for profit. Of course, in one of the film’s few conventional leanings, the lines become muddied for Sarah when she begins to get close to the group and begins to see their point of view. What gives THE EAST its edge is not the supposedly shocking revelation that people eat food from the bins in the back of the grocery store instead of buying it off of the shelves, but rather Britmanglij and Marling’s ability not to pick sides. The company Sarah works for, which is led by a callous, Patricia Clarkson, follows whatever money that is thrown its way. It is not interested in doing any great good but rather will protect the interests of whoever can afford said protection. Meanwhile, The East is not so altruistic either. Naturally, the members are just people and people act upon their emotions. They have families and pasts that influence their decisions as well. In the end, THE EAST paints a rather tense but also rather bleak picture about the selfishness of humanity but in doing so, it just may open a few eyes to a whole other way of life. Great review! I’m really looking forward to seeing this one. Especially for Sarsgard. I didn’t get to focus too much on him in my review but he does a great job. The entire cast is pretty solid. It’s not a revelatory film but it’s pretty darn sharp and effective. I hope you like it! That just about tersely sums it up as best as can be done. I thought the formal (strait jacket attired dinner) was very pointed since Sara didn’t get it @1st.